Hypertech Max Energy - Pann Auto Performance - San Diego largest aftermarket automotive performance parts - What do you drive? Fuel wasting torque converter slippage. With the additional power and optimized transmission functions, drivers use less fuel to accelerate and maintain cruising speeds without the torque converter un-locking and transmission down-shifting to a lower gear. 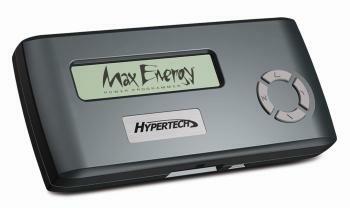 The results are maximum power and fuel mileage.Max Energy…The Best Hand held Performance Tuner On The Market! Higher compression ratio engines and engines with superchargers or turbo chargers were designed to use only premium octane, so only one (1) Power Tuning program for premium octane is provided. But, if your car or truck came from the factory capable of using more economical regular octane, then two (2) optimized tuning programs are provided: one for premium, and the other for regular. In most cases, Hypertech’s exclusive Power Tuning for regular octane provides excellent power gains, almost as much power as premium octane. If you are using premium octane, and you want all out, maximum power, then select premium octane Power Tuning. We recommend premium octane tuning for vehicles using E-85 fuel. The improved engine tuning will increase the part-throttle efficiency and wide-open throttle performance compared to the factory tuning. Three (3) stages of Power Tuning are available. Even the highest power level Stage 3, maintains safe EGTs while towing the maximum weight specified by the vehicle manufacturer. No other tuner offers this level of power for towing. Hypertech’s low EGTs, proper transmission shifting and superior tuning that doesn’t require de-fueling, giving the Max Energy Power Programmer the performance advantage.